It's come to our attention that the nesting season for the Downtown Peregrine pair may be over sooner than we all think! A development project of BET Investments next to the building where the 3rd Avenue nest is located has decided to obtain a United States Fish and Wildlife Service permit to remove the 4 chicks, who are only 2 weeks old. The permit is within the parameters of the newly relaxed Federal rules related to migratory birds. The chicks are to be taken away from the nest and raised at a rehabilitation facility. Louie, Dori, and the chicks only need about one more month for them to fledge and leave the nest forever. We urge you to contact BET investments to express your displeasure and to urge them to delay the removal of the peregrine chicks. I also asked on the Pitt FB page if the permit had already been granted. If it hasn't, then we also need to bombard that office with our emails too..and encourage them to deny, deny, deny!! this upsets me to no end. I fight this at our sites every day. they could have waited. There is a second egg at Grand Haven! Did anyone notice when it arrived? The first egg was 4/25, so this one probably was laid last night 4/27 or this morning 4/28. We'll have to watch when the next egg arrives to be sure. No, they will need more than another month--that's just for them for to fledge! They're going to need flying lessons & lessons to catch their own food taught by the parents. What I've seen it that will take them a good month or two to be ready to leave the area. If one month is the best anyone can do, then they would be better off with the wildlife service that's equipped the handle young falcons. RE: Pitt Falcons...and just an FYI...in Case the names don't ring a bell, Loui and Dori are our Gulf Tower PeF's!! Email Info for PA US Fish and Wildlife. I think the most familiar name on that list will be Bob Anderson. BET Investments Website. Major "Players" List with email addresses. I for one will be emailing the President. I have made a copy of this year's [international] PeFa calendar and sorted it on the date the second egg was laid. Great help to figure out which nest to watch more closely around hatch day. Thanks SgB for the Gulf Tower info - will send off e-mails today!! The fourth egg hatched on April 25. Decin, Czechia: Three hatches, two during the night, the third one hatched around 10 am local time. 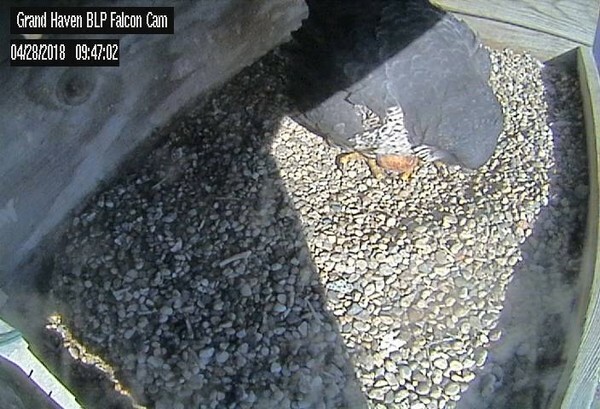 We have a new Kestrel cam in Salt Lake City and a new member who hosts it. Please welcome imede and check out her cam and all the info about the 5 eggs there! I host a Kestrel nesting camera at http://www.imede.com/kestrel/index.html. It is located near Salt Lake City, Utah. As of April 22, 2018 there were five eggs. 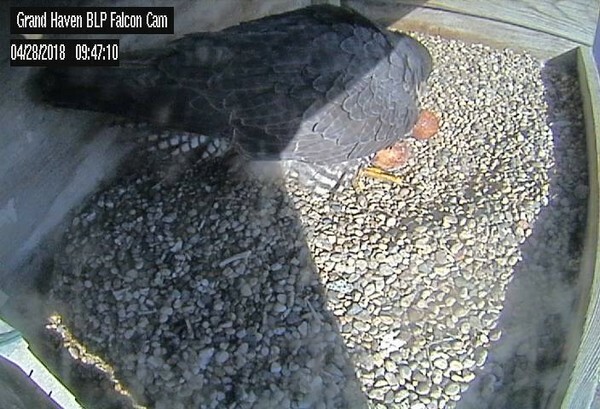 According to photo and video records the first chick is expected May 16.